If anyone choose to look at our “dot” they would find that we had stayed in Linton. We’ll in spirit we did but in reality we had moved back to Shelter Bay. But that doesn’t count. IB (svPassport)reported a bit ago that while he was gone a year and half a friend of his had only thought he and Becca were gone a couple of months. Our cruising compadre’s on Como No had said of their circumav when we had commented on how young they looked that when you circumnavigate you subtract 10 years from your living. Basically, you travel for free around the world. Dirk and Silvie on Lison Life will be able to bank 7 years as they’ll soon be finishing their 4 year circumnavigation. But for us; we ended up with some extra time at the dock replacing power on the boat. Maybe our Karma is back. The following day or the same day; when problems occur time takes on a new dimension. We started up the generator and cooled the freezer and icebox down, then before we shut the generator down we started up the main engine. Once the main engine started the boat didn’t need any more electricity. It’s a diesel and even with dead batteries and it’s own non electric fuel lift pump it would run. And we still had electric, just not a good full house bank. We pulled anchor and headed back to Shelter Bay Marina. There we could plug in and had access to shore transportation as well as other; in our mind, necessities. By 7 am we had cleared the outer reefs and W/ headed on a course to Shelter Bay. By 10 am I had contacted them on the phone and let them know we were coming back, John the manager was glad and sad but said there was a slip for us; simply call Frank on the VHF when we were close. Now in and secured we began trying to figure out how to get back up and running. Brian on Darramy was selling his Gel Batteries before we had left. We tried to purchase them then but he didn’t have the replacements and was worried that if he didn’t get the replacements by the time he had to go through the canal he would really be up a ditch without power. So we had wished him well and taken off. Fortunately he hadn’t received the batteries yet and fortunately he hadn’t someone else wanting his 3 year old Gels. So we made a tentative deal; tentative on when he pulls them out they can sit and hold a charge for 24 hours. Yes; our Karma may well be back. The day we returned was Halloween in the US and indeed we looked to be skipping the trick and maybe able to enjoy the treat. Chris at the Dock restaurant was hosting a Halloween party and although I wear my disguise 24/7 I was still allowed to attend. As we were loaded for our cruise to the hinterlands we had lots of treats aboard (remember I’m a junk food junkie) and we brought some up to the restaurant for the kids. What outfits they had on! So kool to see them dressed as Pirates, Witches, Angels, etc. That evening survived we were back to our battery issue. Had we been required to order some new Gels they would have taken at best 25 days or at worst 35 days. That’s if we were lucky. 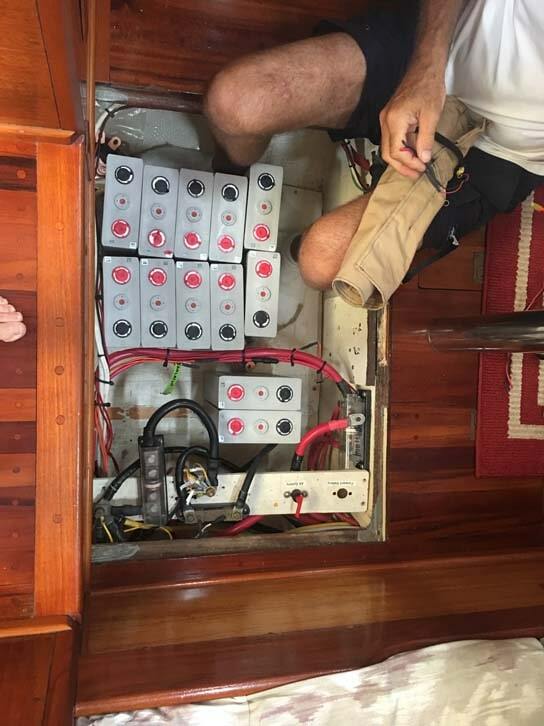 We could have purchased wet celled batteries in Panama but I don’t have a dedicated Battery Box for wet celled batteries and we’re not like a Catamaran where we sail flat. I priced out locally purchased Optima Blue Top AGM’s and they were $400 each (roughly $150 each in the states) and when I got a quote on locally purchased high quality Gels they were more expensive still. Since we heel up to about 15 degrees (that’s our sweet spot) and we can often roll up to say 25 degrees I didn’t want to go with wet; that leaves Gels or AGM’s. Wet celled batteries are meant to be used horizontally. Our next task was to unload the 8D Lifelines; heavy suckers, and to get the space ready for the 4 Group 27 Gels. This would involve redoing some wiring and changing around some of the cleating that holds the batteries in place. We don’t relish them moving when the boat is in any kind of heavy weather. I just don’t think it would be fun trying to coral a 75 lb battery that is sliding around the cabin. didn’t slowly wander off into the sunset, they went south fast leaving little or no warning. Further; after reading Morgan’s Cloud website where they’ve been working with a Lifeline engineer, they’ve discovered that to keep the Lifeline AGM’s really healthy and to get the most amp hours / dollar out of them, you really need to condition them once / month (in wet celled batteries that’s called Equalize). In addition a posting on the Cruisers Bulletin Board one individual noted that an Optima engineer said that may be best to for their line but it’s not yet the company line. To condition them you need to run the Lifeline batteries up to 15 + volts for 8 hours or 16 volts 6 hours. 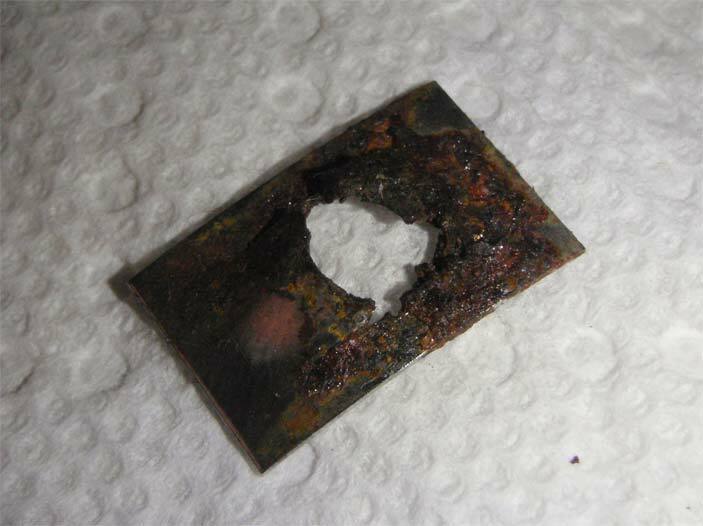 Then you need to make sure you have copious amounts of ventilation as the by product of this process is Hydrogen (an explosive gas) as the batteries come back to full life. Further, if you run them too flat they won’t come back 100%; contrary to what was said a few years ago about AGM’s. If we wanted our boat to be a dock queen then AGM’s would be a good option. We don’t want to live at the dock. Now I know there might be a few that have noticed how much time we’ve spent at the dock in the last year – much too long – but that is not what we want to do. I’m sure they’re quite good for RVer’s that plug into the power grid on a regular basis but for a boat on the hook they’re not making as much sense to me now. Thus no more Lifeline AGM’s till the charging process is simpler and the recovery better. Friday came and no batteries. Oh well, we weren’t going anywhere without them. We’re patient. We can wait. I hope. Late Friday evening they were delivered and Brain was planning on the switch out Saturday. By Sunday we would know if they kept a charge and I would begin the task of putting them in our boat. Our friends son, John, had brought the 8D’s aboard for us when we were in New Port Richey; however, he’s in his mid 20’s and could then pick them up and lug them up the ladder and down the steps without killing himself! Once maybe I could have done that. Now; maybe I can do that only once and then take a month to recover but we have two batteries. So I lift one out of the battery compartment and W/ and I take our time placing it under the forward hatch. There we attach some lifting lines to it and W/ uses our mast winch to crank it up to deck level while I guide it out the hatch. We figure if we remove one battery per day that’s enough work. One goes out the hatch, onto the boat, then up and over the lifelines and into a dock cart. There I begin to wheel it down the dock and before I get two boats away a worker on a friends boat wants it. OK. Done with battery one. The following day we do battery two the same way and I give it to the same worker. I’m sure the price of them as scrap is a few bucks (quite a few by Panamain day wage standards) but I doubt I would get anything for it even if I found the scrap yard. He’s happy, I”m happy. We’re ready for our new set. 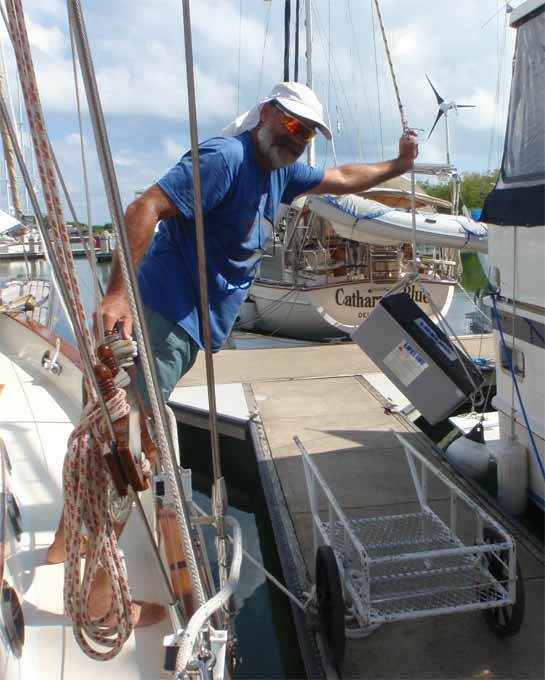 The following day the batteries had held a charge and W/ and I move them to our boat for the install. Clean up the batteries, make some patterns and begin the task of arranging them in and then putting them in our boat. I chase down some more wire; Bill on Bamboo has double ought and discover I need a couple more lugs (Tiffany and Ed on Antigone have 4 and that’s just what I need). By the end of the day the batteries are in place and 99% wired. I’m tired, and have some checking to do so tomorrow I’ll attach the last of the cables and we’ll throw the switch. Bingo! All works well; too well. As I replaced all the house batteries I reprogram the chargers. 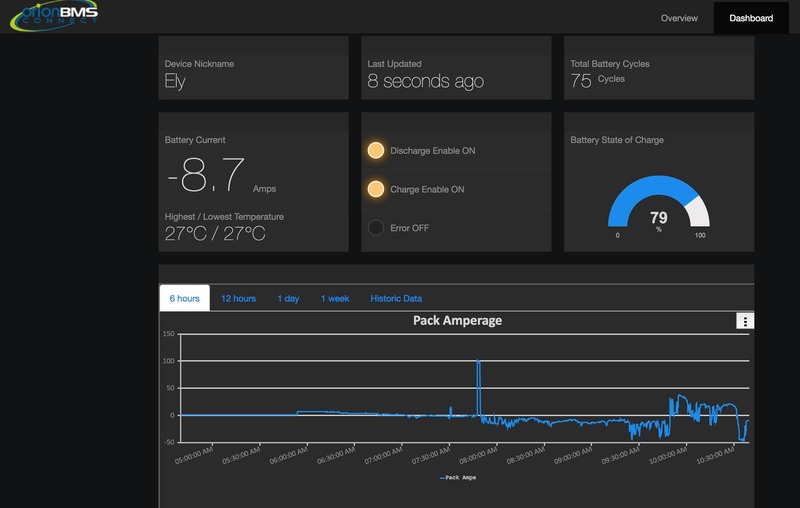 Gels have a different charging regime then AGM’s and I also set up the Energy Management Module (EMON) for control. There I add one more thing to watch; the voltage of the starting battery that is when I discover I have a phoopa! The starting battery charges whether I have the battery switch set to on or off! Oh -Oh! That shouldn’t be. In the four years we’ve been aboard the charger has been charging the house and the starter battery the same and more importantly, i’ve been using the starting battery as part of my house bank. Not good. The starting battery is to be in “reserve” for when we need it. Truth be told, I’ve rarely used it as we’ve had more then enough power in the house bank to start either engine but now I know why I’ve sometimes felt there were gremlins in the electrical system. 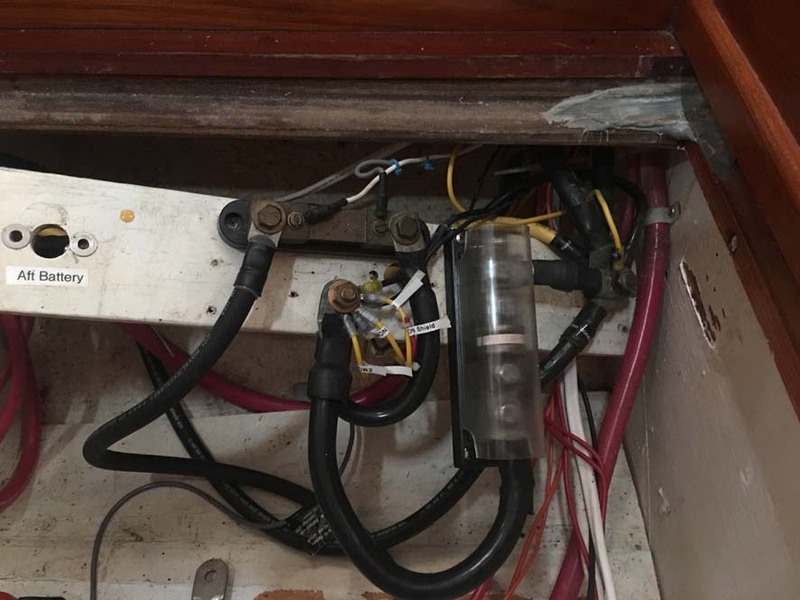 Time enough to look at that wiring when we get back to Kuna Yala, with IB and some Rum I’m sure we’ll get it all straightened out. For the month or so of using the system the same as it was; I don’t believe there will be any problems. The only thing I really need to do is cycle the Gels to 50% of their capacity and then recharge and for that I need to make sure the starting battery is not being drained nor charged at the same time. That discharge help sets the controller up on the EMON to function accurately. Now we begin to look for a weather window to once again leave the dock and head back to Kuna Yala. We’re hoping. We’ve moved around the corner to Linton. About 8 nm farther along. 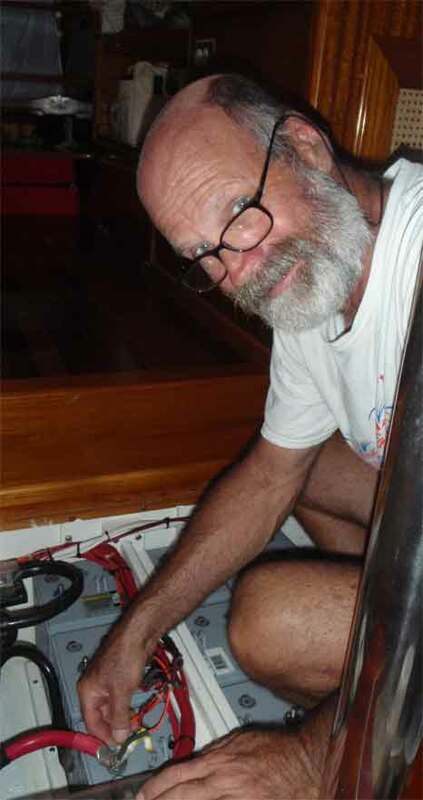 There we hope to isolate which of the 2 Lifeline D8 house batteries is bad and put a dinghy in the water and get ready for our move back to Kuna Yala. John on Millenium is here and I’ve an opportunity to play chess with a real person. Most of my chess playing is on line at FICS when we have a good internet connection. After some chatting we chose tomorrow afternoon for a round of strategic moves. John and I discuss the battery situation and he suggests isolating each one and testing it. Sounds good to me so that evening W/ and I isolate a battery, then run the generator to pull down the refrigeration temp as well as charge. After our 50 minute run time of the generator we shut it down and the only power draw is a couple of 1 amp lights and a 3 amp computer draw. Less than 15 minutes later our battery voltage is 10.5 volts and viola! We found our bad battery. I switch connections and we watch the now good battery stay up on volts. If the battery is really good we have 215 amp hours ideally but practically we have about 100 since IMHO not really a GOOD battery. I’m guessing maybe 50 amp hours to play with. So what. We pick up about 30 amps / day with solar and with the generator running we should be able to limp along. Things look good that evening and throughout the following day. on are rusting so bad the bolts are now just cosmetic. This Yamaha engine is a little over 2 years old, is a marine engine and these doo dads are made of steel! Shame on Yamaha! I open up the carburator to clean the jet and reset it. If memory serves me correct it’s to be 1 1/2 turns back. I put it back together and there is still drips. Oh-Oh. I reopen it up and close the jet all the way. We open up the fuel and no leakage. That’s a good sign – we’ll see if she starts. Put the engine on the dingy and after several pulls (we remembered to attach the dead man switch) she starts up. Unfortunately she needs some choke to run so I need to sometime back out the jet a 1/4 turn at time to see if I can get it ….just right. Ok, we’re rather pleased with ourselves and all set to move to Kuna Yala. Now we set up to enjoy the day. Mother Nature has other designs on us. From roughly noon till midnight it rains. People living in the temperate zones don’t have a clue what a rainy day really is. In the US when it rains it’s mostly from a front moving through. My mom use to say “Rain before 7 quit by 11”. Four hours of rain and that was a relatively accurate. Here it rains, and rains, and rains. and…. you get the idea. 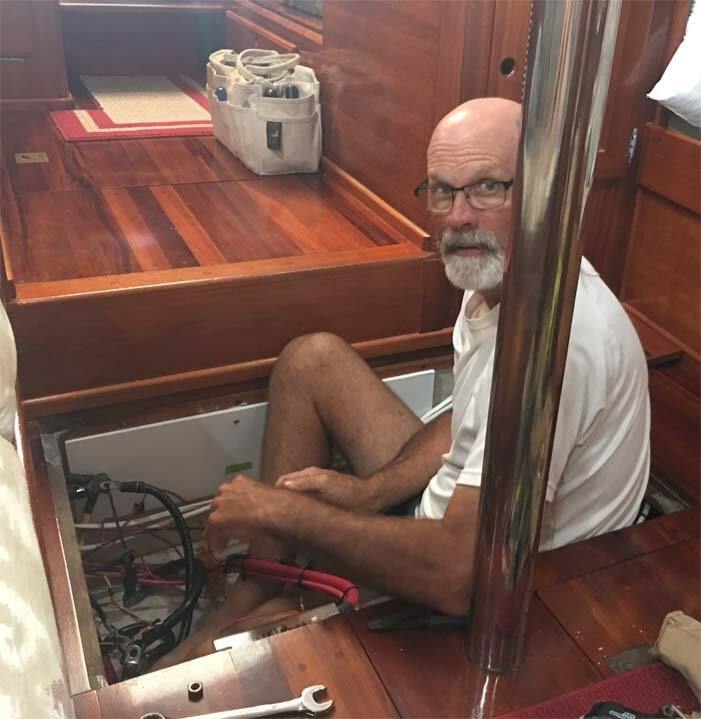 Somewhere in the middle of the night I rouse myself out of my berth to open the hatches and ports; the rain has stopped, to check the surroundings and make sure all is ok. I look at the battery (not batteries anymore) and discover an issue. Last night we charged it; and the battery settled at 12.58 volts after charging. Now it’s reading 12.03 volts. Effectively a flat battery after drawing out say about 15 amp hours! If we continue on we’ll have no real reserve power in our house bank – no real power at all. It means instead of heading on to Kuna Yala we’ll head back to Shelter Bay. Life could be worse. We could be driving on Hwy 19 or sitting on the Beltway. We could be in a meeting with someone spouting off the new politically correct way education is to work. We could be farther away from a solution. Luckily we’re only a 1/2 days travel to a place we can solve the situation, provided the main engine will start.